Now that the Obamacare health insurance "exchanges" are live, experiencing technical difficulties, and facing growing scrutiny for risking Americans' privacy, Americans concerned about just where their hard-earned tax dollars are going might want to know more about Obamacare "navigators." Hint: They don't carry maps and compasses, and they aren't carefully vetted government agents, though their groups are collecting millions in taxpayer money. Some of the navigators are illegal aliens themselves. 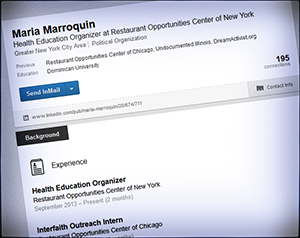 The state of New York has designated the labor union front group Restaurant Opportunities Center of New York, or ROC-NY, as one of its navigator groups — basically authorized and paid-for community organizing for Obamacare. And guess who ROC-NY's lead is for its health program? Maria Marroquin, an illegal alien from Peru who's a DREAM activist. It would be hard to make up something this outrageous. Marroquin practices the political tactics of left-wing extremists, flouting her illegal immigration status before cowed law enforcers and politicians. She has signed up for the end-run DACA amnesty program to launder her status, Associated Press reported. Obama's DACA invigorated Marroquin and her ilk to go forth and break the law even more. "This [DACA] just showed the power that we have and the power of organizing to create some sort of change," said Maria Marroquin, 25, a pre-law student at Dominican University near Chicago who came to the U.S. illegally from Peru when she was 13. Marroquin founded Dream Activist Pennsylvania in 2009 and was one of seven young people arrested when they sat down in a downtown Atlanta street in April 2011 as an act of civil disobedience. Marroquin's DREAM Activist Pennsylvania thumbs its nose at the rule of law on which American government and society rest. The group describes its position: "We reject society's notion of a model immigrant and the demand for cultural assimilation." Obamacare's implementers declined to check the backgrounds of prospective navigators, regardless of the obvious potential for crime, fraud, and abuse. So, even an illegal alien radical has become an Obamacare navigator. It's not just illegal or criminal aliens who pose a threat to privacy and security. Lawrence, Kansas's only navigator, Rosilyn Wells, has an outstanding warrant out for her arrest. But you can bet Marroquin, who has an arrest record of her own, isn't the only illegal alien to obtain this role. What especially compelling temptations will illegal alien navigators face when opportunities present themselves: steal someone's identity, tap into their Social Security or savings? The hiring of navigators and their assistants has been rushed, diffuse, and even politically suspicious. With flagrant lawbreakers serving as Obamacare navigators, particularly foreign criminals like Marroquin, congressional inquiries into navigator organizations become all the more important. Navigators sit in a position to prey upon unsuspecting people, who trustingly share their sensitive personal information. The Marroquins and Wellses of the navigator world could commit fraud, financial or identity theft, or other crimes against their victims seeking help to enroll in health care. The causes of concern over this subjecting of innocent victims to unvetted potential predators are well-founded. That's why more than a quarter of the states have taken steps to help rein in the mess the federal health law has wrought. "[T]he main concern for consumers is the heightened risk of identity theft and financial loss from a poorly managed outreach campaign," the Oversight Committee report said. "Navigators and Assisters will come into contact with a plethora of personally identifiable information (PII), including an applicant's Social Security number, date of birth and income, as well as the PII of everyone in an applicant’s household." Conceivably, navigators could facilitate identity theft and fraud to benefit illegal aliens. They could very well steal from Americans and sell to illegal aliens. The risk for wholesale crime through the exchange navigator scheme is a clear and present danger. Americans who are assigned to a navigator should be on their guard.